Our major focus for this release is our new Wisenet Resources (hint- you’re currently in it!). In addition to this we have centered our attention for this month on applying feedback from You, our customers. Although, we could not include all of your feedback for this release we are excited to bring you these changes. There are a stack of bug fixes in this release. If you have logged one, we will contact you personally. We are excited to bring back Wisenet Webinars as a regular feature on your calendars! Last month we discussed Learncycles and Moodle Connector. If you missed the session we will shortly be releasing the video for Learncycles. Stay tuned for dates for our next Webinars on Course Offers and Reports. We have been busy working on creating the new Wisenet Resources for quite some time and are excited to finally be able to share it with you! Journeys. These are a guided articles that take you on an entire process through Wisenet. Notices. Keep up to date with latest Wisenet and Industry news. You can focus on the more important things like growing your business. You will notice that the tab Clients is now Learners (Clients). We are starting to transition to Learners as it is more inclusive terminology in Vocational Education. People being trained vary in relationship with the training providers as they can be referred to as: Trainees, apprentices, students, employees any more. We have chosen the term Learner as it applies to all types and it is also being used more frequently by the governing bodies. We started to use Learner with the Learner App and we will be continuing to update our resources to reference Learner. Due to this, please start to use Learner in Wisenet Resources when searching for How To’s etc. If you type Student or Client it will still show results however, using Learner will be more accurate. After a Credential has been generated/issued and has been converted to a PDF the editing features have now been locked. 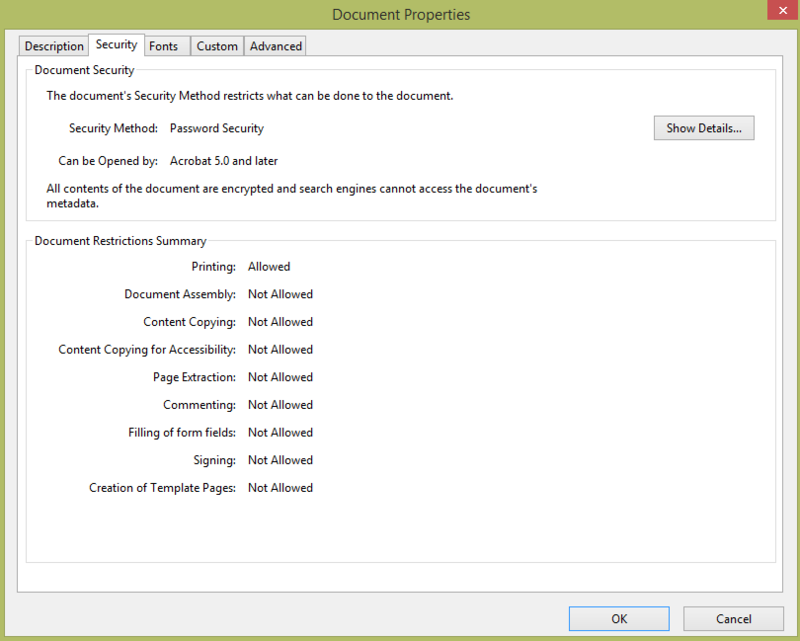 This was added to increase security to prevent any editing of the PDF document. Now only printing is available. To view this see the Security Properties of the issued PDF (not in Wisenet but in the generated PDF). A screen shot of this is shown here. This action allows you to set a Client to be Active or Inactive. You can easily identify which Learner has completed their studies. When marked as No it prevents any changes to be made to that Learner record. This gives you confidence that records cannot be altered for auditing purposes. You can still reactivate the Learner and set to Is Active = YES. Allowing access to Users and not just Admin. 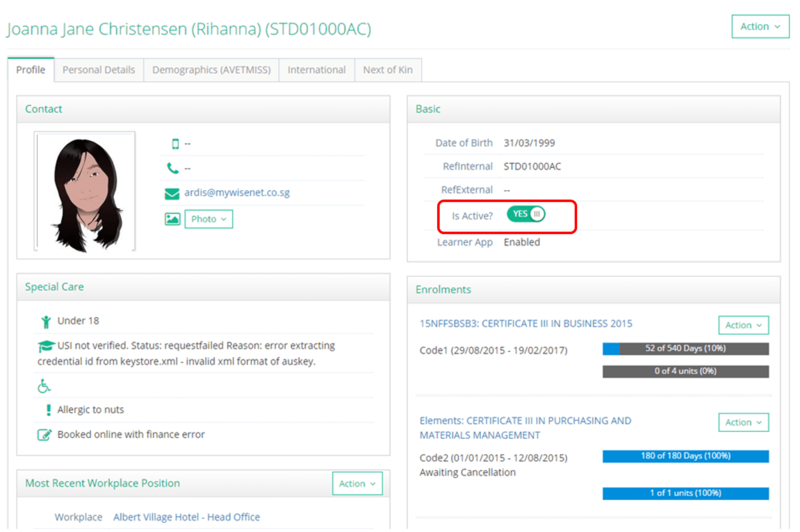 Automatic sync with Learners’ TFN into Wisenet when they submit their eCAF. This will be a huge time saver for your staff. The Course Fee for Western Australia must report the Total Fee and not the Hourly Fee. There is special logic for how this is exported to assist with data entry. If it is not entered in correctly you will have errors in your exports. Our focus for the July release was new compliance requirements and continuing to test some behind the scene features that will assist with larger releases later in the year (such as improvements to Learncycles and Integration!). These changes will enable us to make updates and improvements more rapidly. Places are limited so make sure you register to avoid missing out. 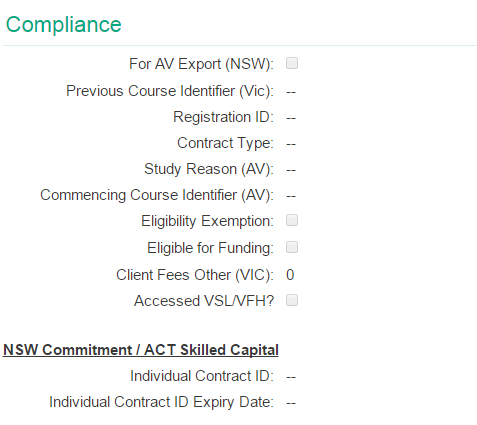 Added field Actual End Date to the Course Offer > Enrolments Page. Previously, this displayed the Nominal End Date. Now, this will display the the Actual End Date a Learner has completed. 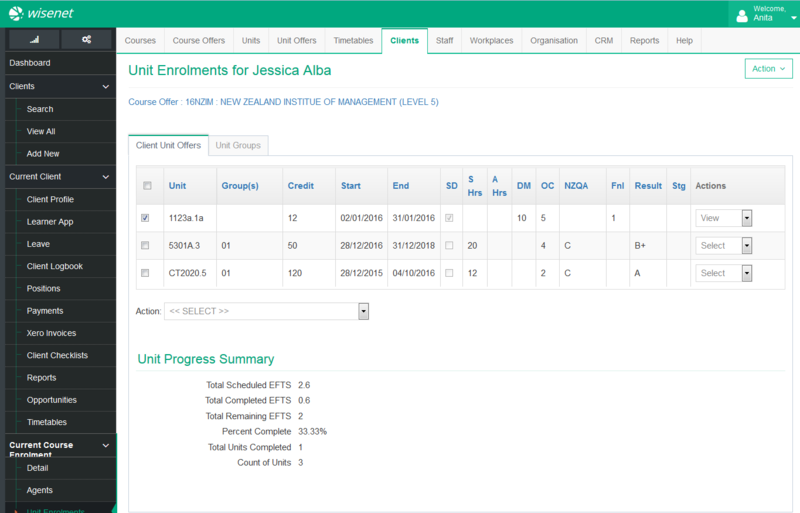 If the Actual End Date is empty at the Course Enrolment level it will show Nominal. This allows for greater transparency and understanding of End Dates for enrolments. All Learners with an enrolment status of Current, Pending, Enquiry, Code 1 or Code 2. If a Learner has another status not listed above but still has an End Date of this year they will be included in the count. A new update option called Custom is now available for both Learner App and eLearning access. This allows you to customise and set specific dates for access. Due to the transition from VET Fee Help to VET Student Loans we have added a more options to select VET Student Loans in dropdowns. Last year Wisenet created one-way integration to allow you to send your eCAF from within Wisenet. Two-way Integration has been completed AND now means you can see the status of your eCAF enrolment from within Wisenet without the hassle of logging into eCAF! We have separated the eCAF’s into Pending and Unprocessed. You can also see why an eCAF is yest to be completed. To see how you can do this follow the instruction on How to Send Enrolment Details to eCAF. Progression Forms which are referred to as Student Engagement and Progression is a survey that is periodically sent to the learner and is now a compliance requirement. Instead of logging into eCAF to send the Progression Form you can do it all from Wisenet. To learn more see How to Request VSL Progression Form. Previously, there were 1000’s of options to select regarding countries and language choices! Now, this has been drastically reduced to just over 200 countries and a significantly less language classifications. This allows you to quickly and more easily find the right option. A new code can now be entered for certain Learners that have an Individual Exemptions and therefore, do not require a USI. For these Learners you will still however, require a value entered into the USI field. You can now set the Commencing Course ID, Study Reason and Study Mode at the Course Offer to set defaults for enrolments. A new Funding Source Code 31 is required for Non-funded confirmed student enrolments. It is best to refer to the specifications from TEC Confirmed Student Enrolments regarding this change. Our main focus for the June release was planning for future releases. It focused on testing and releasing smaller (behind the scene) features that will assist with larger releases later in the year. These changes will enable us to make updates and changes more rapidly. The main impact of our June release will not be seen for a few months. We have been listening to your feedback and have implemented some updates that are explained in more detail below. The capacity to bulk update Unit Enrolments has increased! This feature has been increased to allow bulk updates of 25 learners instead of the previous 10. It allows individual edits on multiple records. Therefore you can complete updates more rapidly across fields. Did you say that I can import my own Scope? Yes! You heard it right. You are now able to import your own Scope, except for Short Courses, directly into Wisenet without logging a ticket. This saves you time as it provides the information directly from training.gov.au. Wisenet has resources on how to import your scope. Simply follow the instructions and if you feel stuck in the process, do not hesitate to search through our learning resources for more help. Now, before you go ahead and import your own scope, please note that if you deliver Short Courses, you will still need to add your courses manually. Don’t panic – here are instructions on how to manually add a course. We have improved the filtering on the Result History Export to only show data that is relevant to that particular export. Some of the Fields referencing Australian requirements have been improved. 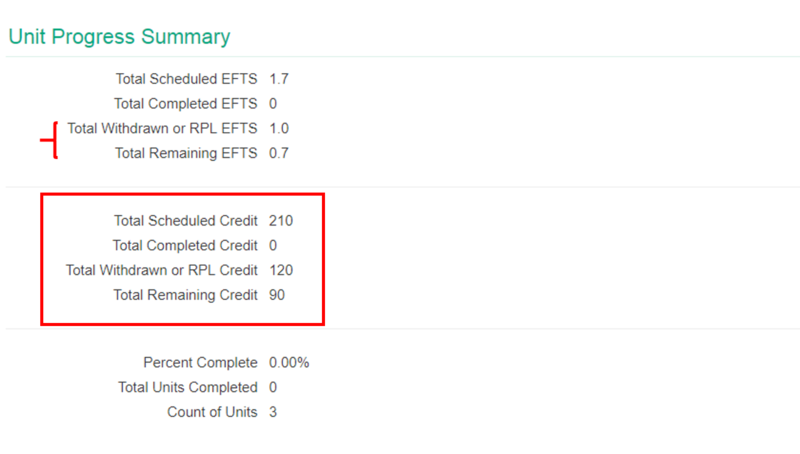 Previously EFTS information was found individually for each Unit Enrolment. There is now a summary of EFTS.